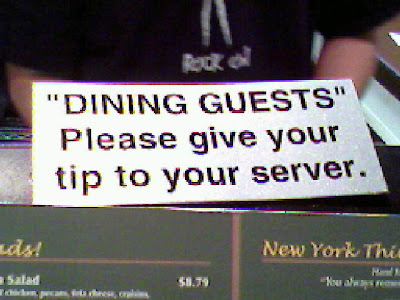 I guess you don't have to have dinner or be invited in order to tip your server. Thanks, Denise and Julia. I have been reading this blog for a while... and have ALMOST broken myself from using unecessary quotation marks. The fact is... I'm afraid to use them now! If only I... could... stop... using... ... ... ... ... these ellipses! Are we really dining guests? Or Starving Aliens?